short girl, long island. 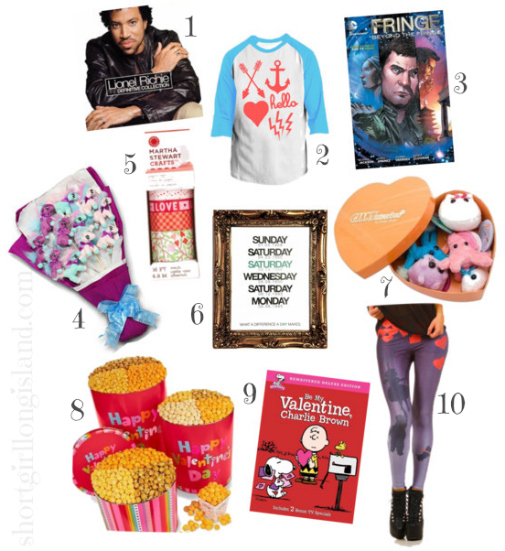 : Gift Guide: Valentine's Day. I don't know about you, but I like marching to the beat of my own drum. When it comes to the holidays, I like to find unique gifts that won't collect dust [or even worse, be re-gifted]. I got my Sherlock Holmes on + found gifts that would be great for guys + gals, young + those who are young at heart! 01. Lionel Richie - The Definitive Collection [$8.49] For under $9, you get a hard copy containing 20 hits, plus a free MP3 download of the album. One for them, one for you. Everybody wins! 02. Hello Apparel Kids Neon Raglan 3/4 Sleeve [$28-30 $22.40-24 with coupon code makingitlovely] I love Hello Apparel! I own half a dozen items from the company + really love these unisex kids baseball tees, which are available in sizes 2 - 12. 03. Fringe - Beyond the Fringe [$10.19] Erich + I have recently become obsessed with Fringe - this is actually one of the presents I got him for Valentine's Day. Graphic novels make great gifts, plus Joshua Jackson, who portrays Peter Bishop on the FOX series, helped pen this as well. 04. Plush Unicorn Bouquet [$49.99] Instead of spending an arm + a leg on roses that won't last more than a week, opt for a bouquet of plush unicorns. Sounds strange, but I promise you, this rules. 05. Hearts + Flowers Paper Tape [$10.67] This is a great gift for your crafty pals, teachers + even little ones. This paper tape [also known as washi tape] has multiple uses + looks super cute. 06. Weekdāzed Date Art [$10] The gentlemen of Weekdāzed came up with the genius idea to create customizable works of art with the days that are important in your life. Births, engagements, wedding day, house closing date, the date of your final student loan payment, you get the idea. 07. Giant Microbes - Heart Warming Mini Microbe Box [$19.95] Want a unique gift for the med professional or scientist in your life? These mini microbes are a surefire way to make them smile. 08. Happy Valentine's Day 4-flavor Popcorn Tin [$29.99] The Popcorn Factory has made a two gallon tin with four flavors - butter, caramel, cheese + white cheddar. It sounds like a lot of popcorn, but once you start digging in, you'll see how fast it disappears. I'm trying to figure out how to drop the hint to Erich that I want this instead of chocolate this year. 09. Be My Valentine, Charlie Brown [$9.96] Holidays aren't the same without Charlie Brown + the gang. If you have Amazon Prime, you can actually stream this for free! 10. POPRAGEOUS Girl Saves Boy Leggings [$65] Inspired by a piece created by street artist Banksy, these leggings would be a really fun piece to wear for your Valentine's Day date! What are some fun items you have come across for Valentine's Day? Include links if you'd like, so other readers can check out your finds as well. Popcorn instead of chocolate? Amen, sister! !